Since the original 48" CS flew and was subsequently published, I've received a steady trickle of requests for a larger version. Now that the editorial team has also started in on me, I thought I'd better have a bash at it! So we're looking at a 60" version to suit a 5S set-up. Besides being a handy size on the flightline, 60" is also deemed to be the largest size that will fit on a freebie plan. That's good enough for me! I've decided to switch from the 10% aerofoil of the original, and go to a 12% semi-symmetrical section instead. The aluminium wing joiner is going to be replaced by a hardwood joiner - I heard tales that epoxy won't bond to ali as well as it does to wood. 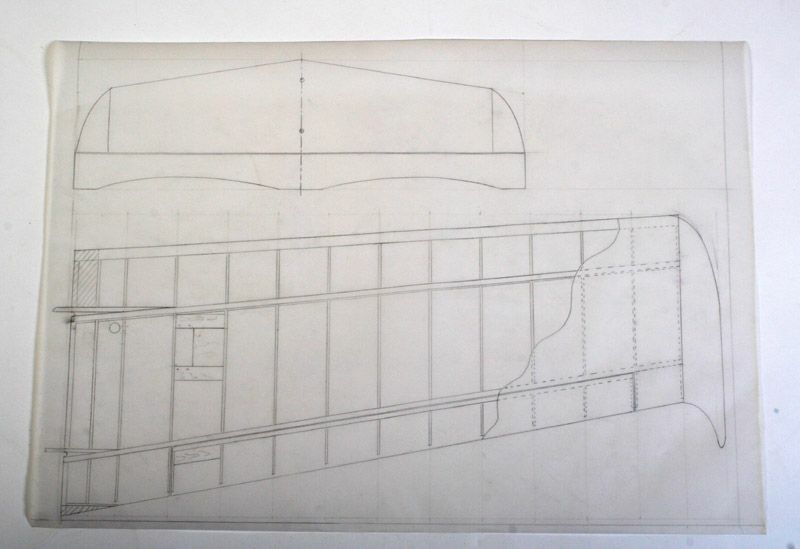 I'd like to make the T-mounted tailplane removable too. So the crayons are out again, and so far I've pencilled in the general outlines. I've referred back to my original sketch in order to get the proportions right. Really looking forward to this one Tim! Now I am really interested - the 48" was a great looking model but a tad too small for me and I like the sound of its big brother having a .55 engine up front! Are there plans for a wood pack etc as well? Jon, free plan yes and a wood pack yes, all being well. 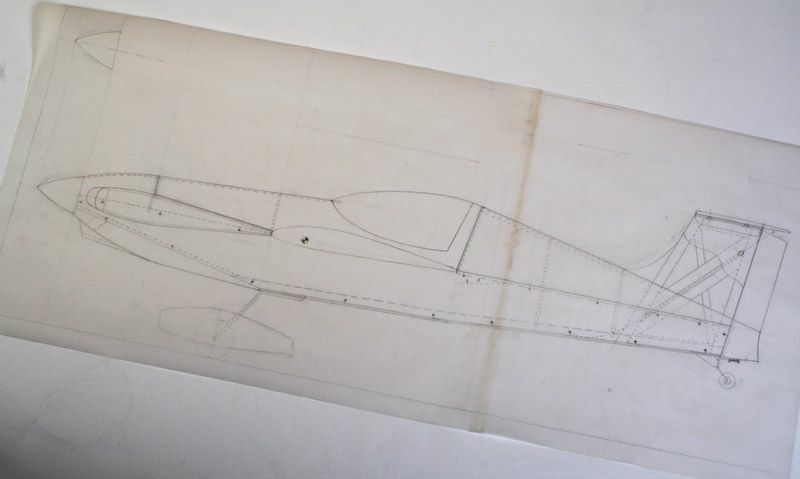 Thanks David - that' great but it looks like another project for the forthcoming winter then! May have to be spring as I am planning on a trad build Supermarine Type 224 after I have assembled the H9 Corsair that is! All with OS 55s marked down for them...where's the flippin piggy bank? And.....I was forgetting that I quite fancied the Tucano that's leading the 2013 mass build - doh! Being a subscriber on this forum is getting very dangerous with all the temptation around! Foam wings ..... Foam wings .…please either supply end templates or ask cloud models to offer wings for her then she is a really quick build (only the fus to build) for the lazy sods amongst us! Please !!!!! 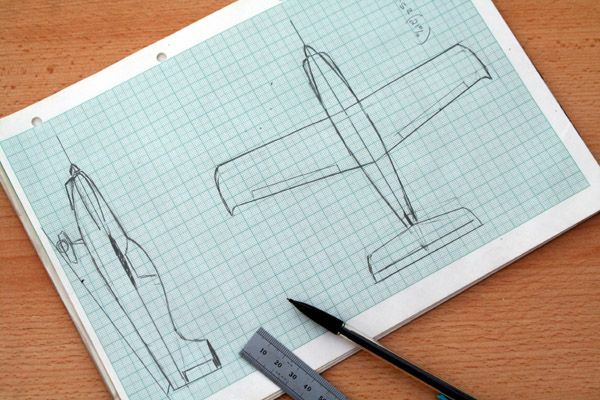 Irrespective of the wing construction with there be one or two aileron servos in the 'as drawn' design? Right, I'm expecting this project to take me up to Crimbo, so it'll be liable a little while after that before it's flight-tested and published. All being well, that is. 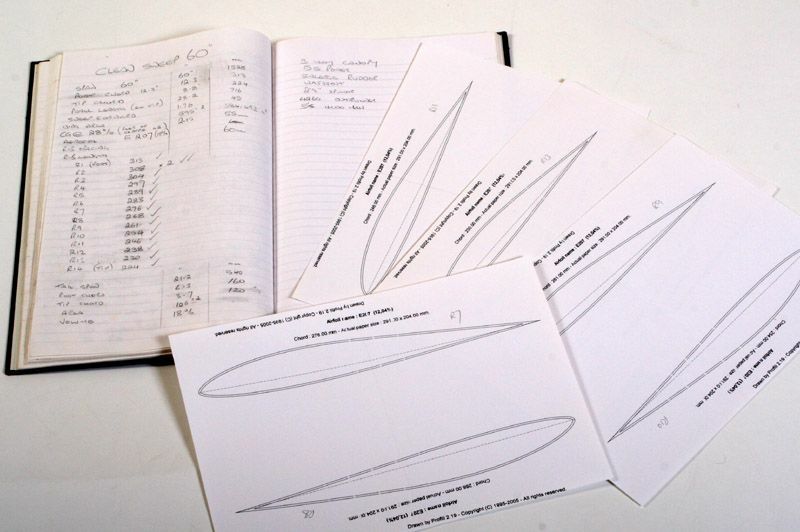 Here's the wing plan. There's an aileron in each panel too! 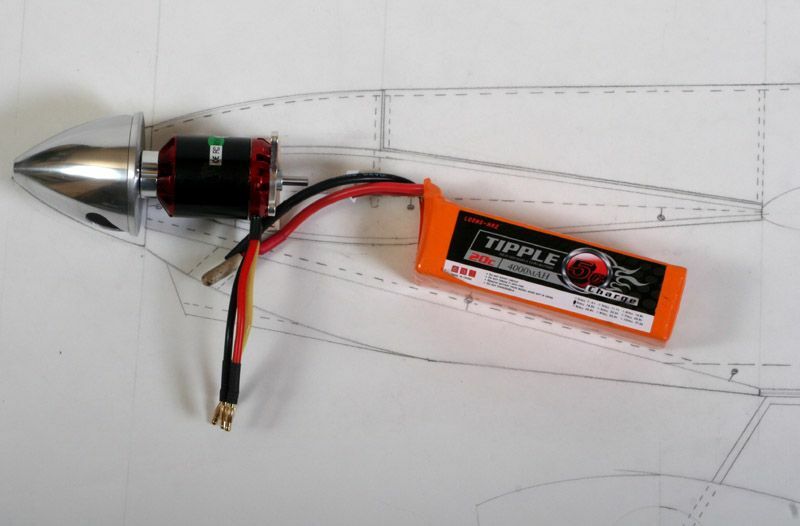 There's a no-name 4260 600kv motor from Giant Shark (looks like an earlier Turnigy to me, but it's only 20 quid! 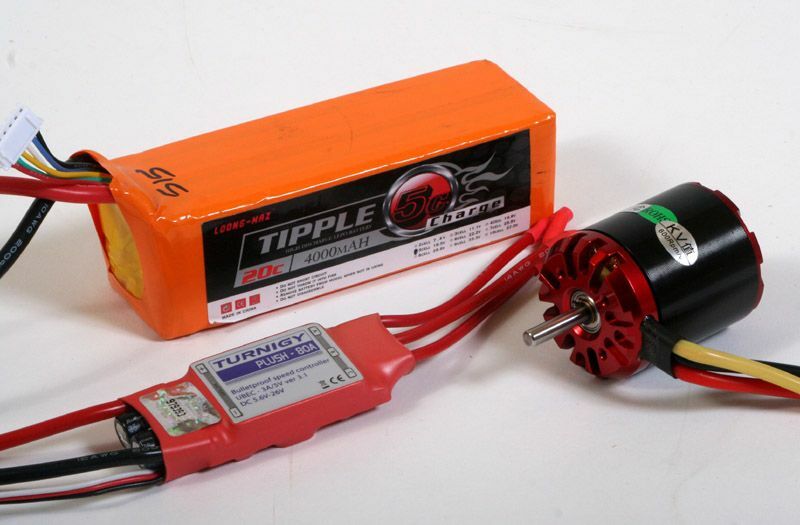 ), an 80A Turnigy ESC and a 5S 4000Mah pack. Here's the motor, spinner and cell pack being tried for size. 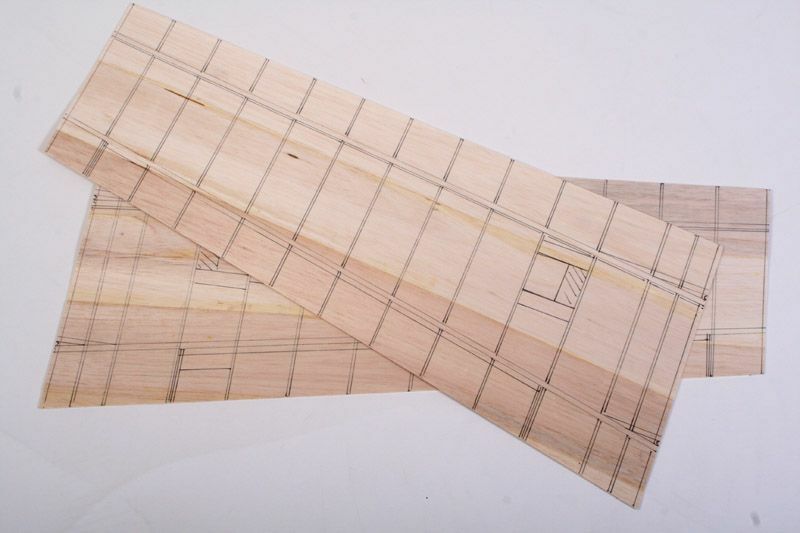 Lee, wouldn't it be possible to work out end templates from the drawn ribs? I've no experience of foam cutting, so any input would be useful! Come come now Tim...Thats a fib isn't it. Surly not , Just an ideal paper weight ! . I think it's fairy PVA, probably makes the wing lighter or something? I may be strange, and some may say mad. but starting a build with the wing skins! So what's odd about starting with the wing skins? 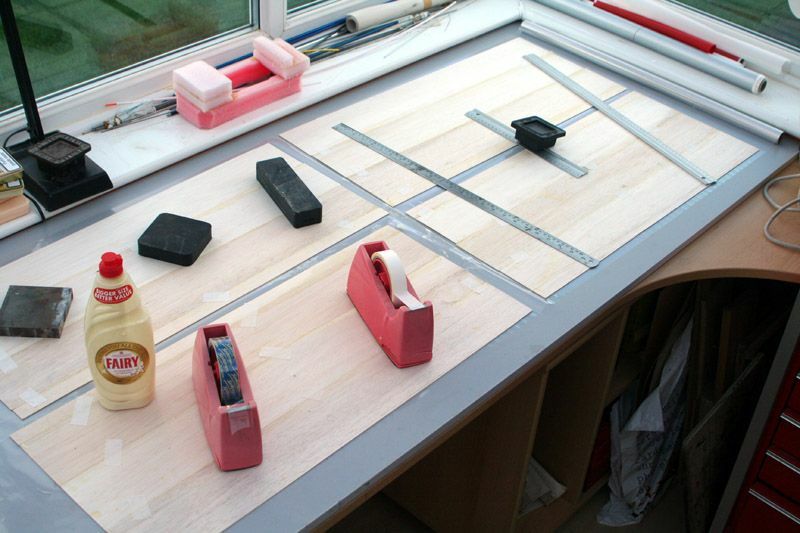 On the CS you need the completed wing, bolted to the fus in order to make the upper decking. The wings are built on the lower skins. So the skins come first, OK? It all makes sense - honest! Right, after a blissful session at the field, followed by a life or death struggle with a recalcitrant lawn mower, I eventually got back into the workshop for an hour and marked out the lower skins.